Welcome to the Fit Small Business Xero training course! In our last lesson, we showed you how to add bank/credit card accounts and download transactions into Xero. In this lesson, we’re going to show you how to reconcile those downloaded bank/credit card transactions. Why Is It Important to Reconcile Bank & Credit Card Transactions? All transactions are categorized to the appropriate account. This will ensure that your financial statements are accurate and always up-to-date. If you have set up your bank/credit card accounts with either a direct feed or a Yodlee feed, then you will receive new bank & credit card transactions at least once a day. With this daily update, there is no need to wait until the end of the month to reconcile your bank & credit card accounts! Entering these transactions before you begin reconciling will save you time, since you won’t have to enter them as you are reconciling, which may slow you down. When new transactions have downloaded from your bank account, you will see the reconciliation button that shows you the number of transactions as indicated in the screenshot below. Click this button to see the details of the transactions that need to be reconciled. Xero Bank Reconciliation Starting Point. As soon as bank & credit card transactions are downloaded, Xero compares them to transactions that you have entered into Xero. As a result, transactions will generally fall into one of three groups: Match, Bank Rules Applied or Suggestion. Let’s discuss each of these next. 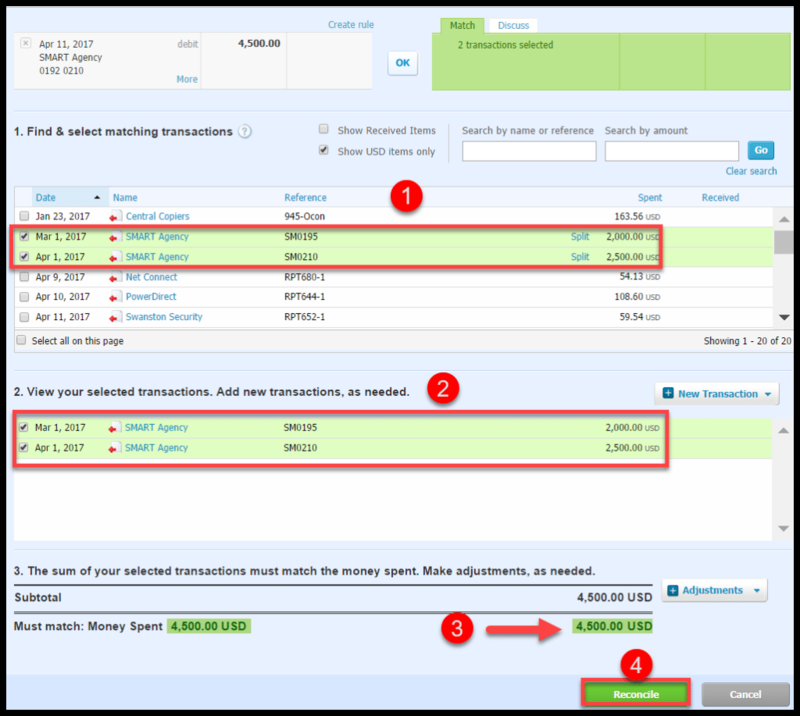 Match – Xero automatically matches transactions downloaded into Xero with the appropriate transaction (e.g. invoice bill, etc;) in your system. The matches are based on the amount, closest due date and then the customer/supplier contact name (in this order). Xero Automatically Reconciles Bank/Credit Card Transactions with the Match Feature. To accept the match, you would just click the “OK” button located in between the two transactions as indicated in the above screenshot. Once you do this, Xero will mark this transaction as reconciled. If you don’t want to accept the match that Xero has made, simply click the link to to the other possible matches found and select the correct transaction to match. Bank Rules – Bank rules are a way to quickly reconcile transactions that you have not entered into Xero. This comes in handy especially for those recurring transactions. Example: Let’s say that Bluehost bills you monthly for web hosting services. You can set up a rule that will always code Bluehost transactions to an expense account called web hosting fees. You can click here to learn more about how to set up bank rules. If the downloaded transaction meets the criteria of a bank rule, then Xero will apply that bank rule as indicated in the screenshot below. You can click the “OK” button if you want the rule to be applied or click the Don’t apply rule link if you do not want the rule to be applied. Suggestion – If Xero cannot find a matching transaction or a bank rule to apply then it will suggest that you create the transaction based on a previously reconciled transaction with similar details. As indicated in the screenshot below, Xero will populate the Who, What and Why fields based on a previous transaction. To accept the suggestion, just click the ”OK” button. Xero Automatically Reconciles Bank/Credit Card Transactions using previously entered transactions. The majority of your bank & credit card transactions will most likely be reconciled using one of the 3 methods discussed in the previous section. However, if you still have a few unreconciled transactions, we’ve got a few more techniques that will help you. We will start with the Find & Match tool, then talk about spend/receive money transactions and finally wrap it all up with cash coding. You can search for a bill, invoice or account transaction that was entered into Xero and reconcile it with a downloaded transaction from your bank. From the reconciliation window, click on the “Find & Match” link as indicated in the screenshot below. In the next screen, you will select the transactions that match to the downloaded banking transaction. See the screenshot below along with a brief explanation of each section. Select matching transactions – Put a checkmark next to the transactions that match up with the downloaded banking transaction. In this example, there are two transactions for SMART Agency that make up the total downloaded transaction of $4500. Note: You can also search for transactions and filter them in this screen as well. Verify selected transactions – You will see the transactions you selected in step 1 listed here for you to confirm. Note: If you need to add a new transaction in this screen, you can do so by clicking the New Transaction button as indicated in the screenshot above. When you enter a new transaction, there are 3 different types of spend money transactions: direct payment, prepayment and overpayment. To learn more about spend money transactions, check out our How to Manually Enter Bank/Credit Card Transactions lesson. Compare Totals – Make sure that the sum of the transactions you have selected match to the total amount of the transaction that was downloaded from the bank. If for some reason there is a discrepancy, you need to fix it before you go to the next step. Note: You can make minor adjustments (under $1.00) in this screen by clicking the “Adjustments” button as indicated in the screenshot above. 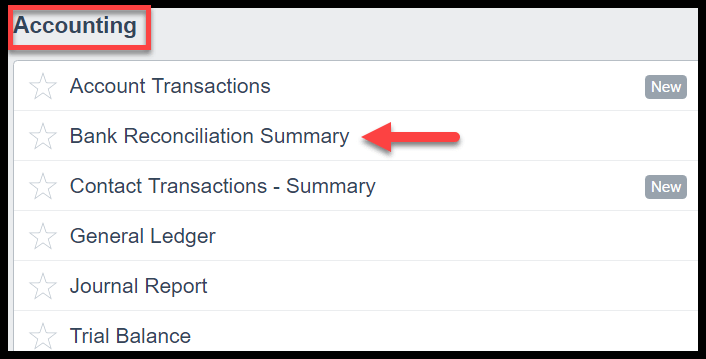 Reconcile – Once your totals agree, you can click the “Reconcile” button. You can add a spend or receive money transaction to record and reconcile a payment that is not related to an invoice, bill, expense claim or bank transfer. Note: You only want to do this if you have not previously entered the transaction into Xero. From the reconciliation window, complete the Who, What and Why fields as indicated in the screenshot below. Create a Spend/Receive Money Transaction while reconciling in Xero. Cash coding shows all unreconciled bank & credit card transactions that have been downloaded into Xero in a spreadsheet format. You will create a spend/receive money transaction that matches and reconciles with your downloaded banking transactions. Note: Cash coding can be a powerful tool and should only be given to an experienced bookkeeper or accountant. To learn more about user permissions, our How to Invite Multiple Users in xero lesson walks you through how to grant/restrict access in Xero. From the reconciliation window, click on the “Cash Coding” tab to the right of the “Reconciliation” tab as indicated in the screenshot below. You will find a brief explanation of the info you need to provide below. Payee – You can sort this column (and any other column) to group transactions for the same payee together, (i.e. Central City Parking). Reference – This field is optional and can be used to enter a reference number or any additional info you would like to use to identify the transaction. Note: One of the benefits of cash coding is that it allows you to code a “batch” of transactions all at once! Step 1 – Put a checkmark next to the transactions you would like to code as we have done for the Central City Parking transactions. Step 2 – For the very first transaction in the batch, complete each field (Reference, Description, Account, Tax Rate). As you enter the info for the first transaction, Xero will copy that info to the remaining transactions that you have put a checkmark next to! This will save you a lot of time if you have a bunch of transactions that have the same payee, description, account and tax rate info. Be sure to periodically save your work! Be sure to check out these shortcuts on reconciling using cash coding. After you have reconciled all transactions, you need to make sure that you are in balance. This means that all downloaded bank & credit card transactions match up with a transaction in Xero. You can do this in a couple of ways; first take a look at the bank balance that appears on the Dashboard. If you are in balance, then good job! However, if you still have unreconciled items (and you were under the impression that you had reconciled everything), then you need to review the Reconciliation Summary report. We will talk about both of these next. Simply return to the dashboard where we began this lesson to see if the reconcile button has disappeared. If so, in its place will be a checkmark and the words “Reconciled” as you see in the screenshot below. Follow the steps below to run the bank reconciliation summary report. From the Dashboard, click on Reports, All Reports. Select the Bank Reconciliation Summary report from the Accounting group as indicated below. Navigate to Bank Reconciliation Summary report in Xero. 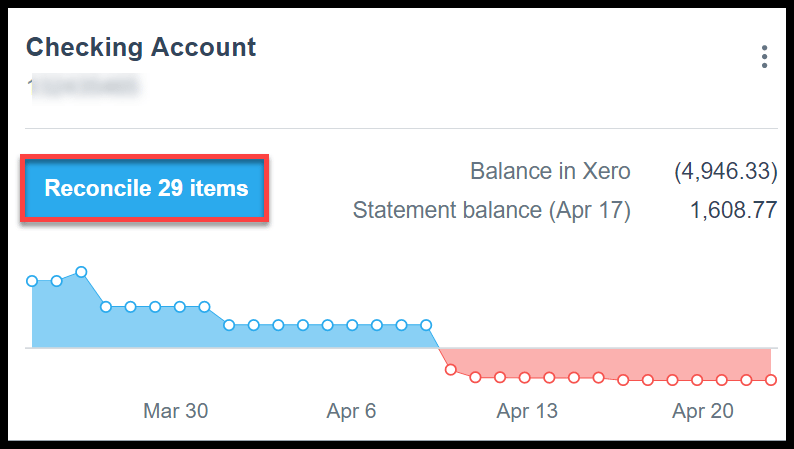 Below is the bank reconciliation summary report which compares the balance of the transactions in Xero to the transactions downloaded in Xero from your bank. Below the screenshot, you will find a brief explanation of this report. Review Bank Reconciliation Summary Report in Xero. Bank Account – Select the bank account from the dropdown. Date – Select the date you would like to run the report for. Note: This should be based on the date range of the transactions you have reconciled. Update – Click the “Update” button to refresh the report for your selections. 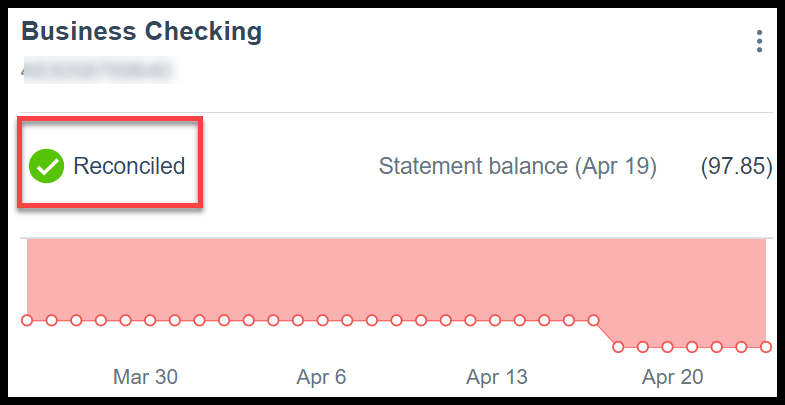 Bank Statement – If you click on the “Bank Statement” tab, it will display each banking transaction that was entered manually (or downloaded) into Xero via the Bank Feed. As you can see in the screenshot, this report not only shows you the details of each transaction but also whether or not it was reconciled and the source of the transaction (i.e. Bank Feed). Review Bank Statement Report in Xero. Statement Exceptions – The Statement Exceptions tab shows a list of transactions that were not reconciled along with the reason. Below is a snapshot of this report. Save as Draft – You can save this report as a draft so that you or someone else can easily access it again. Publish – This allows you to save a Draft report as a read-only final version of a report. You can also Publish reports without creating a draft version. Print – Print a hard copy of the report. Export – You can export this report to an Excel spreadsheet, PDF or Google Sheets. If you are still out of balance after reviewing the bank reconciliation report, the bank statement and bank exceptions reports, take a look at our troubleshooting tips on reconciling. That wraps up the section on How to Reconcile Downloaded Bank & Credit Card Transactions. The next lesson in our Xero Training Course will be How to Manually Enter Bank/Credit Card Transactions. In this lesson, we will walk you through how to manually enter banking transactions that are not related to an invoice, refund, bill or expense claim. To access this lesson or any of the others in the series, click here. For a free 30-day trial of Xero, click the button below.